AUDEMARS PIGUET REF. 26157 S.R. 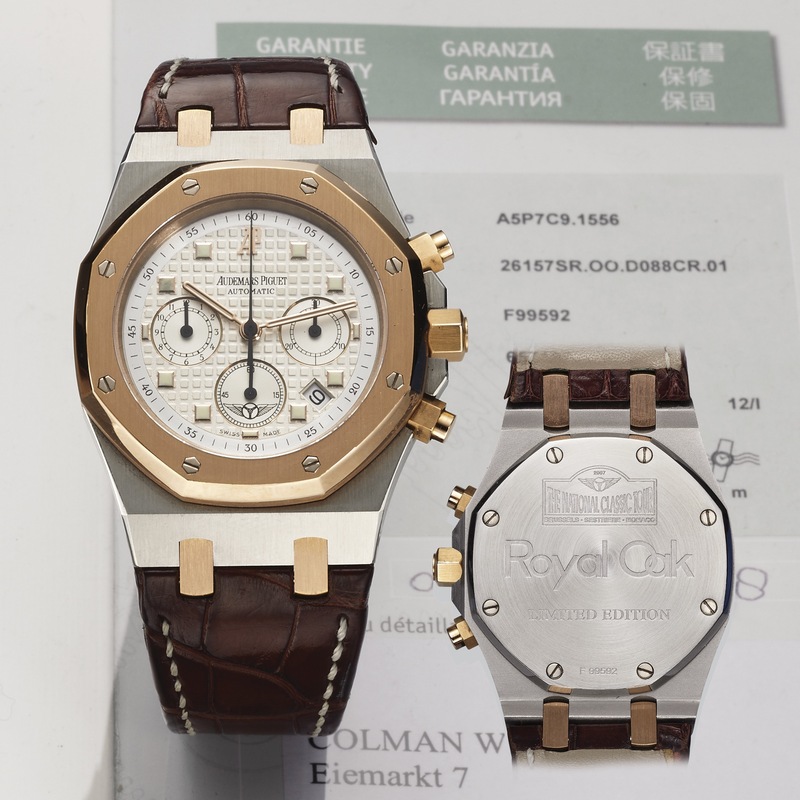 ROYAL OAK "THE NATIONAL CLASSIC TOUR" LIMITED EDITION STEEL AND PINK GOLD Audemars Piguet, Genève, "Royal Oak Chronograph, The National Classic Tour," case No. F 99592, Ref. 26157. Made in a limited edition of 40 pieces in 2007. Very fine, large, tonneau-shaped, octagonal, self-winding, water- resistant, stainless steel and pink gold wristwatch with round- button chronograph, registers, date and a stainless steel Audemars Piguet deployant clasp. Accompanied by a fitted box, Certificate of Authenticity, and guarantee. Three-body, polished and brushed, case back and bezel secured with 8 hexagonal screws, screwed-down winding crown, case back engraved with "The National Classic Tour," 2007 logo, sapphire crystal. White with checker board decoration, square pink gold- rimmed luminous indexes, subsidiary dials for the seconds, the 12- hour and 30-minute registers, outer seconds track with 5-second Arabic markers on an inclined silver reserve, aperture for the date between 4&5, sapphire crystal. Luminous pink gold baton hands. Cal. 2385, rhodium-plated, oeil-de-perdrix decoration, 49 jewels, straight-line lever escapement, monometallic balance adjusted to heat, cold, isochronism and 5 positions, shock absorber, self-compensating flat balance spring, 22K gold rotor. C. Three-body, polished and brushed, case back and bezel secured with 8 hexagonal screws, screwed-down winding crown, case back engraved with "The National Classic Tour," 2007 logo, sapphire crystal. D. White with checker board decoration, square pink gold- rimmed luminous indexes, subsidiary dials for the seconds, the 12- hour and 30-minute registers, outer seconds track with 5-second Arabic markers on an inclined silver reserve, aperture for the date between 4&5, sapphire crystal. Luminous pink gold baton hands. M. Cal. 2385, rhodium-plated, oeil-de-perdrix decoration, 49 jewels, straight-line lever escapement, monometallic balance adjusted to heat, cold, isochronism and 5 positions, shock absorber, self-compensating flat balance spring, 22K gold rotor. Case and movement signed. DIAM. 40mm. THICKNESS 11 mm. The AUDEMARS PIGUET NATIONAL CLASSIC TOUR ROYAL OAK was released in 2007 as a limited edition of only 40 examples to celebrate the annual classic car rally from Brussels to Monaco. The rally is currently only open to vehicles built between 1930 and 1969.